- We made a test club, on a different website, where you can log on as any club officer and practice creating meetings, assigning roles and everything else. - Also visit our YouTube channel that has many training recordings Click here. You can watch recordings of past webinars and, you might want to check out the training videos. discussion forums for "How do I...? " and "Problems"
a communications tool for district officers to reach each other and all club officers. Would you like to volunteer to serve on the easy-Speak Support Team? It's a fun and educational project to work on. Besides being the important centralized communication and administration tool it is, easy-Speak also provides an exciting and practical experience for those of us wanting to learn about developing, administering and training of a professional database management system. We are learning real lessons that we can apply in the real world of business and community organizations. Since 2008, there has been a small group of us who have introduced easy-Speak to the clubs and supported all its users throughout District 59 as our official communication tool. The summary information (club name, location, officers list) for all chartered and prospective clubs of District 59 is already, or should be, registered in the easy-Speak directory. More and more clubs are discovering the value of actively using the PR and club management tools of the system (e.g., tracking projects, goals and attendance). So, the task of supporting all the users has grown to a point where we need to coordinate and improve our support method, now and in the future. So, we have set up a dynamic support model to last through the years. Basically, there will be four teams: local user support, global user support, system support and software development. IT Support: This role offers localised user support in a club, an area or a division. 'Someone who has access and permissions in THAT unit to help a VPE, AG or DG with the use of the program in that unit.' This means that at the club, area or division level, the IT Support has permissions in that particular club, area or division only. Whereas the TM_ADMIN has global permissions in all units of the district. 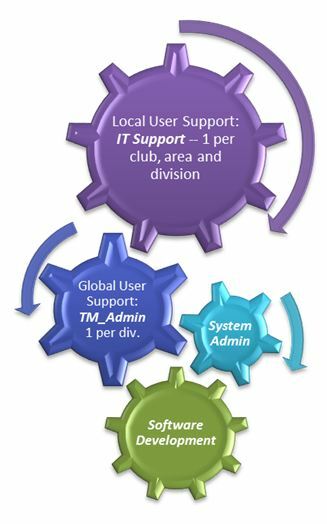 Note that the TM_ADMIN person will support the IT Support people in her/his division, and may or may not also choose to be the IT Support in any particular club, area or division. User Support: We have a team of eleven "Toastmaster Administrators", one in each division directory, who coordinate training and user support for their own division. Besides access to the Control Panel for their own division, however, each TM_ADMIN has access to the Control Panel for all clubs, areas and divisions in District 59. So, they can help out in their division and help out a neighboring TM_ADMIN, if needed. This team is led by the District PR Officer and there are conference calls from time to time to share ideas and experience. System Administration: There is a small group of System Administrators whose task is system maintenance. Think of such tasks as daily back-ups, merging multiple usernames, deleting or unblocking users. They will also be the ones who handle requests from a district officer to set-up any club that has a TI club number, change a club’s name, change a 'summary club' into an 'active' one, or change a club's status to 'dormant' when it stops operating. Software Development: There are several separate systems of easy-Speak being used by hundreds of clubs around the world. Toastmaster Malcolm Warden in England (District 71) is the 'father' and webmaster of easy-Speak. He remains very active in daily operations and works with a Software Development team of multi-national volunteers to release regular upgrades to the system. Webmastering: Malcolm Warden, in England, is the Webmaster for the whole easy-Speak system and other installations of similar systems around the world. Any webmaster in District 59, however, works on websites that are OUTSIDE the easy-Speak system. In District 59, the district, several divisions and many clubs have their own independent website that is maintained and used mainly for public relations. Any of these websites may have a webmaster whose duties may include ensuring that the web server, hardware and software are operating accurately, designing the website, generating and revising web pages, replying to user comments, and examining traffic through the site. Note that the free and easy-to-use PR Portal features of easy-Speak may give reason for any clubs, areas and divisions to reconsider the need for maintaining and paying for an independent website. Toastmasters is all about self-development in a useful and fun way. And, like the rest of Toastmasters, the easy-Speak system is a very important learning tool. Enjoy using it!